Print Run: One print run only. Shirt Colors: Slate Blue, Yellow, White, Mystery! Mystery could be any color or pattern, not just one of the options shown, making your shirt even more unique. Print Size: Approximately 6" x 17"
Reuse Garments (White, Slate Blue): Brand new, old stock T-Shirts from a company that went out of business. Reuse Style (White, Slate Blue): Front of blank shirts. Reuse Garments (Yellow): Most are pre-owned garments that have been rescued. Derek "Deek" Diedricksen hails from Stoughton, MA. His artwork is created on all sorts of reclaimed materials; everything from scrap lumber to notebook pages he finds in recycling bins to old school desks. Deek actually went to college with our founder, Alex, but they didn't know each other until he stumbled across the STAY VOCAL booth at an event. He also makes a cameo in our film, REUSE! 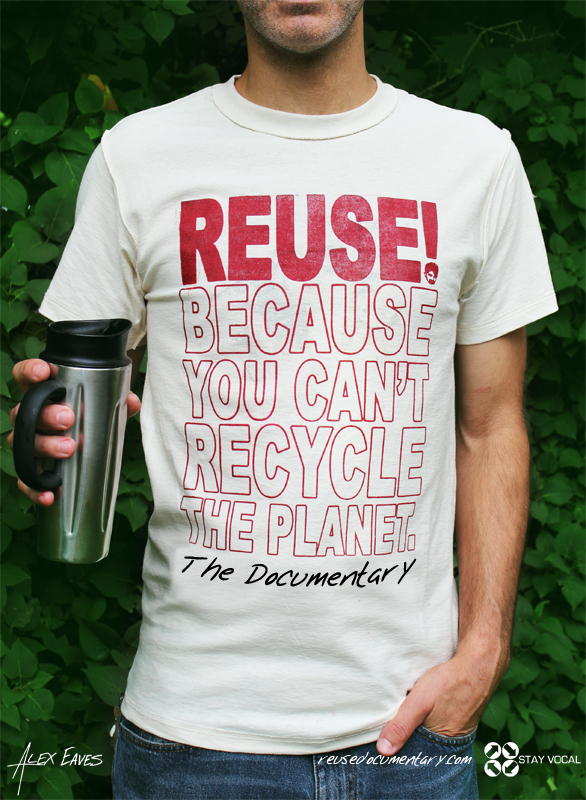 Because You Can't Recycle The Planet. Deek is also a world renowned tiny home builder and author of numerous books on the subject, including his most recent, "Microshelters: 59 Creative Cabins, Tiny Houses, Tree Houses, and Other Small Structures." Be sure to head over to Deek's site, relaxshacks.com, and check out what he's doing. And trust us, this is surely only our first collaboration.